Now that Mama polar bear has another baby in her tummy, Little Cub is bursting with curiosity. Gently and lovingly, Mama and Papa assure their firstborn that the new baby is a gift from God they want very much, just as Little Cub was–and still is. 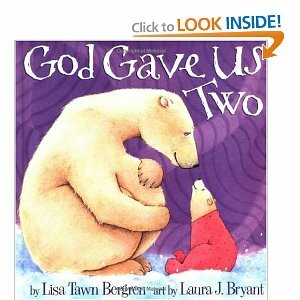 The winsome sequel to God Gave Us You, God Gave Us Two playfully affirms a child’s uniqueness and place in the family and helps little ones accept, appreciate, and love their new siblings. This was a beautiful book. I know that having another child can be very hard on the first born child.. Changes are coming that they don't understand. I really loved the simple story and beautiful artwork. This is just another wonderful story from Lisa Tawn Bergren. It is a great way to help your child through the coming of another child - I just wish I had had it when I was pregnant with Matthew. Gracie could have really benefited from it.